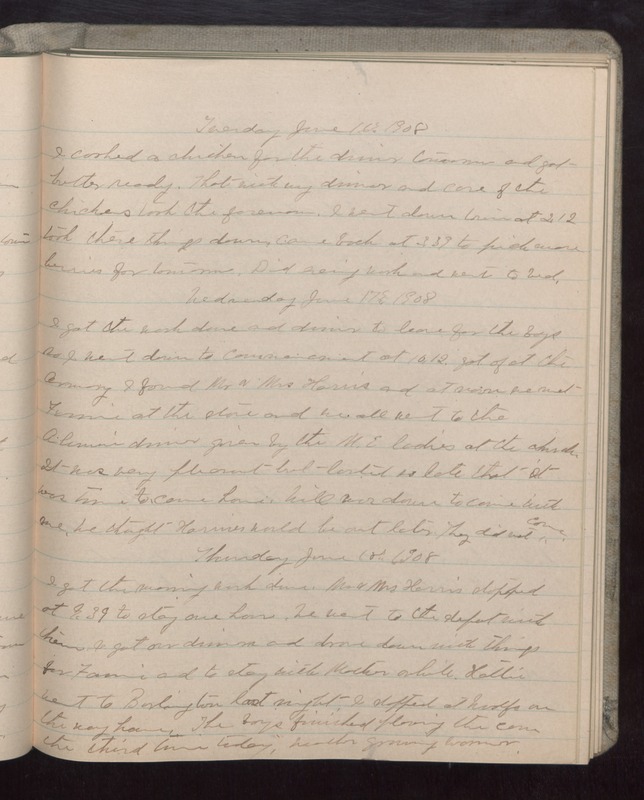 Tuesday June 16 1908 I cooked a chicken for the dinner tomorrow and got butter ready. That with my dinner and care of the chickens took the forenoon. I went down town at 2.12 took there things down came back at 3.39 to pick more berries for tomorrow. Did evening work and went to bed. Wednesday June 17 1908 I got the work done and dinner to leave for the boys so I went down to commencement at 10.12. got of at the Armory I found Mr & Mrs Harris and at noon we met Fannie at the store and we all went to the Alumni dinner given by the M.E ladies at the church. It was very pleasant but lasted so late that it was time to come home. Will was down to come with me. We thought Harrises would be out later but they did not come. Thursday June 18 1908 I got the morning work done. We went to the depot with them. I got our dinner and drove down with things for Fannie and to stay with Mother awhile. Hattie went to Burlington last night. I stopped at Woolfs on the way home The boys finished plowing the corn the third time today. Weather growing warmer.